Monthly Rental. in-Town W Stunning Views. Quiet Street. Desirable Location! 3 Bedrooms and 3 Baths. Sleeps up to 6. 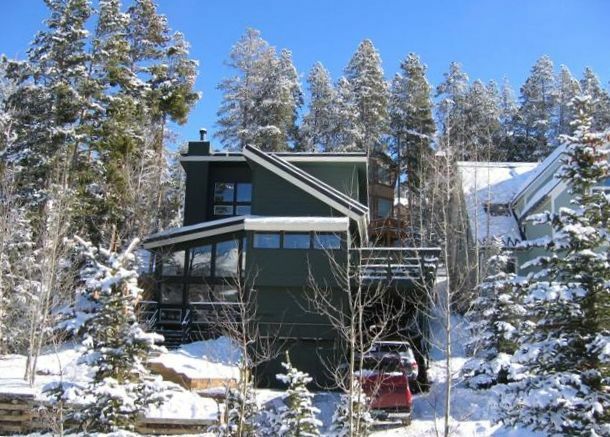 'The Highland Terrace House' boasts big views of the Breckenridge Ski Area. Your sleeping Areas are evenly spaced; with one bedroom on each level. The location of Highland Terrace is very sought after with it's quiet street, close proximity to Washington Pedestrian Trail, an easy walk to Carter Park and just 2 short blocks to the shuttle. Main Street is 4 blocks away for shopping, dining and exploring. A long deck on the side holds your hot tub with glorious views of the Ski Area. On a nice afternoon or evening.... you can eat outside and enjoy our spectacular sunsets over the mountains! The eat in kitchen seats 6. The kitchen is fully equipped. You can even reserve our Private Chef at this location! Secondary to the TV Room is the 'Front Room'. This is the first room you come into.... A charming wood stove is featured with comfortable seating and another large flatscreen. High ceilings and lots of west facing windows! The second and third levels have 1 bedroom each with it's own bathroom. There is a private office; as well as a yoga room. 3 Bedrooms and 3 full baths. Born and raised in the Pittsburgh Area of Pennsylvania; I moved to Breckenridge, Colorado to start 'Jane's Lodges' with my Dad. Photo: Jane and niece, Carson. Started Annual Family Ski Trips to Breckenridge when I was 15! We still do one every year! Living in Breckenridge is magical..... If you spend just a week here; you will definitely experience a little piece of paradise in the Rocky Mountains! We try to create each lodge to exude all of the mountain comforts you would look for while vacationing in our town! The Highland Terrace Property was purchased for it's awesome location in town. just 6 blocks from the core of Breckenridge. West facing views of the Entire Breckenridge Ski Area. Beautiful sunsets and sunrises from the property. It is right next door to this home where the acclaimed "Washington Street Breckenridge View" photography is taken. Awesome... This can heat the house! firwood provided. Phones, Cable TVs, VCRs, Dishwashers, Fully appointed kitchen, Linens and towels provided, Shuttle 2 blocks away, Very well appointed, Great views, Walk EVERYWHERE! Washington Trail next door. Monthly rental. Rate based on a 3-6 month agreement.